I am kicking this weekend off right, people. 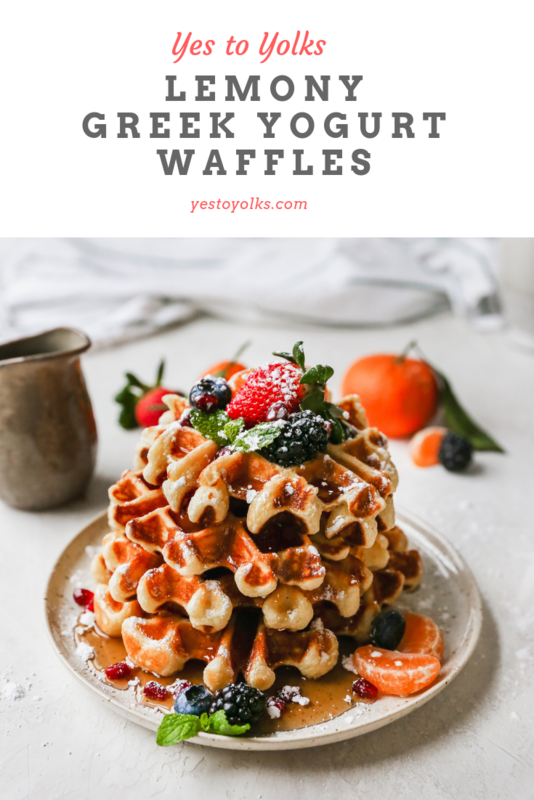 These lemony Greek yogurt waffles are where it is at. I am normally a savory breakfast person. I almost always want something egg or bagel based. 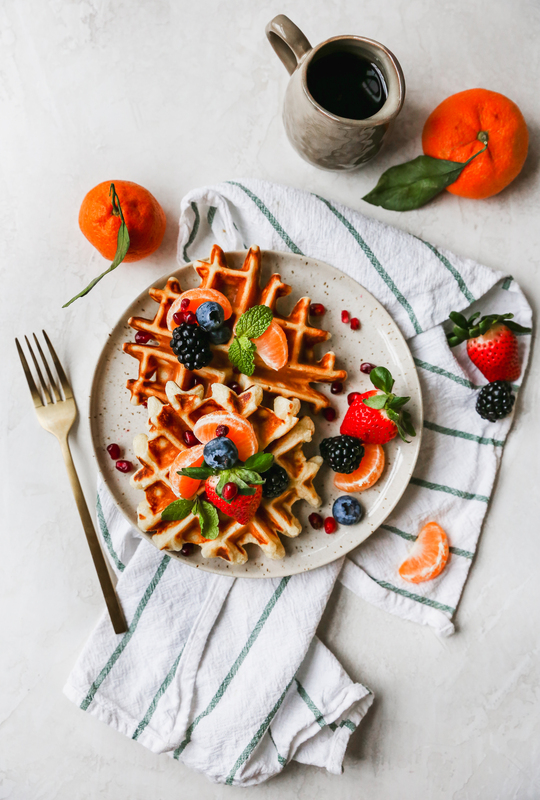 Muffins, pancakes, waffles, pastries…they are always my second choice. Don’t get me wrong, I love them all, but most mornings, I crave a bagel with cream cheese or egg and avocado toast. Growing up, though, mornings mostly consisted of sweeter things. We ate tons of cereal and frozen waffles. 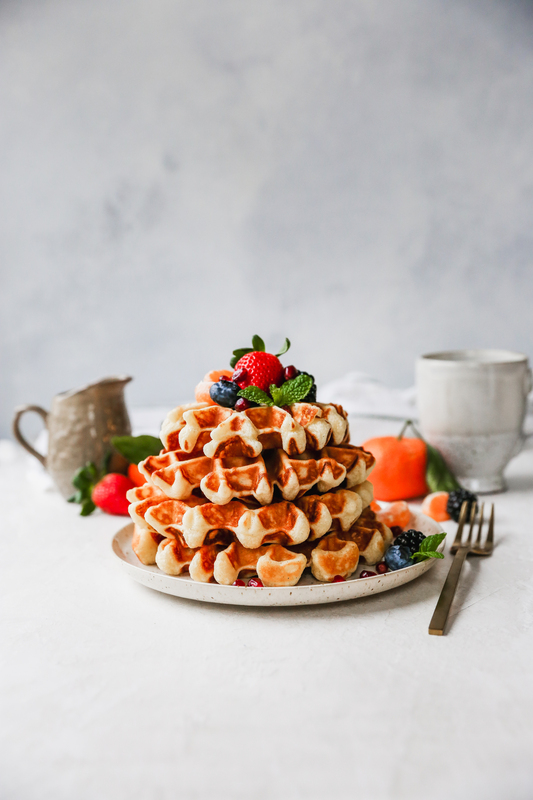 The frozen waffles were a true staple. Sometimes I would drown them in syrup, and other times, I’d load them up with peanut butter and jelly (if you haven’t tried this on waffles, I beg you to give it a go. The peanut butter melts and gets in all the waffle nooks. To die for). Eggs were something reserved for the weekends only, it seems. As an adult, that has definitely shifted. Most mornings, you’ll see me start the day off with a honkin’ cup of coffee and that’s about it. It takes me a few hours of being awake before I’m ready for food. Of any kind. When I do start to get hungry, I crave savory foods most of the time. 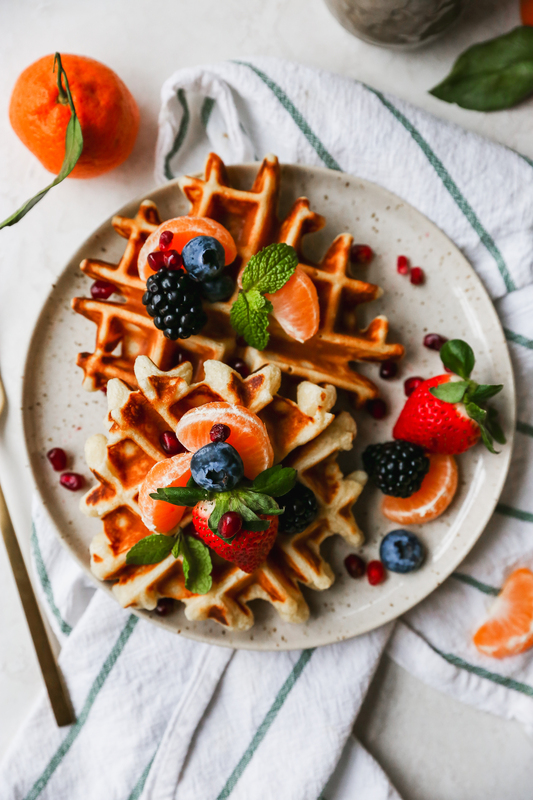 So these waffles are a definite departure for me when it comes to breakfast, but I am embracing them all the same! Weekend breakfasts call for something more special, right? And I LOVE making muffins or pancakes with and for Kieran on those lazy mornings. Waffles are definitely a fun one. He gets so excited watching them transform from batter to crispy waffles. 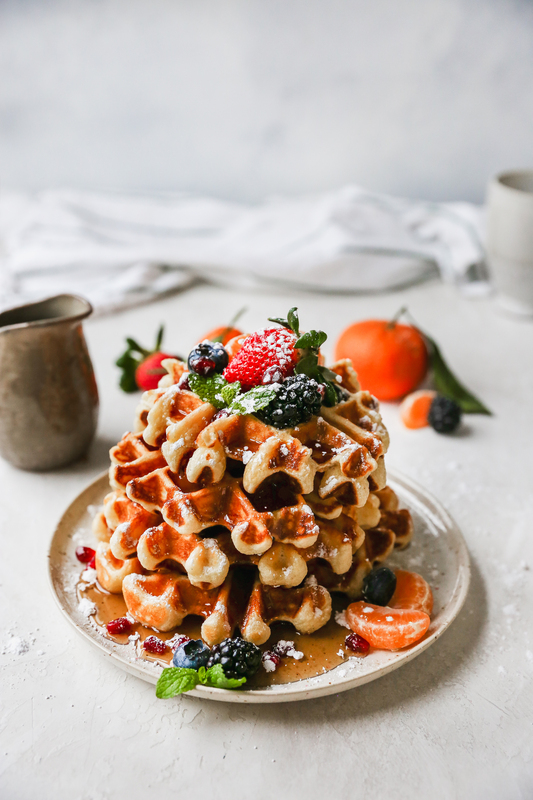 These waffles are light, incredibly fluffy, and scented with lemon. Basically, my dream. I love a fluffy waffle. And lemon flavored everything is my absolute favorite. The Greek yogurt does a lot here. It not only makes them tender and fluffy, but it cuts down on the sweetness just a bit. Gives them that classic yogurt tang. And I, personally, love the balance. 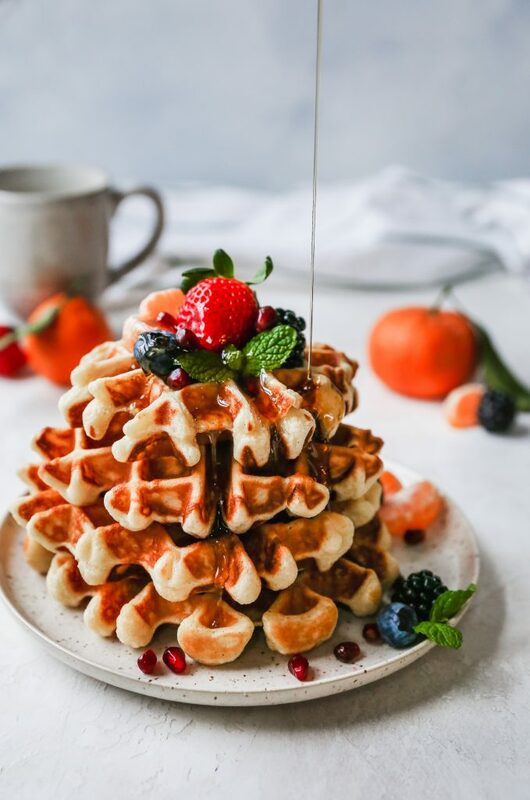 I say balance because I am always, always going to drown my waffles in syrup. Oh and a dusting of powdered sugar, for good measure. It’s just how I do. Sure, I’ll add in some fruit, but really, I’m here for the syrup. Balance. I served this particular batch with lots of syrup (duh) and fresh fruit. Sweet satsuma mandarins (I have been eating them by the case as of late), fresh berries, and a sprig of mint. To really drive home the lemon flavor, feel free to zest some lemon over the top just before serving. It will be the perfect mix of sweet and tangy. You can do whatever you want! If whipped cream is your thing, pile it on. 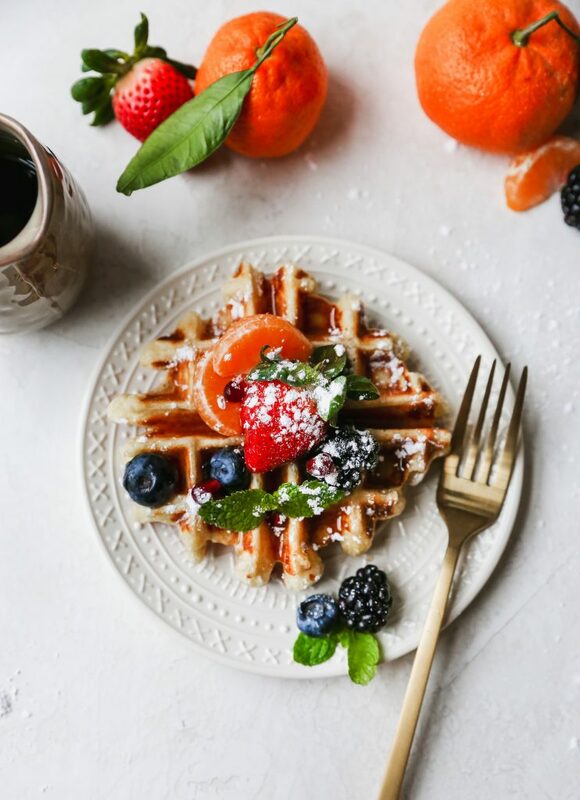 Like waffles with fruit syrup? Go for it. One thing I especially love about waffles is how quickly they come together. I always have these ingredients on hand, so it’s never a question of whether or not I can pull them off. They’re easy, quick, and super fun to make for the family. They feel special to me, too, because waffles have become such a rare occurrence in our house. Perhaps this will be the recipe to change that? Whisk together the flour, sugar, baking powder, baking soda, and salt in a large bowl. In a second bowl, whisk together the melted butter, yogurt, milk, lemon zest, lemon juice, eggs, and vanilla. Gently fold the wet ingredients into the dry mixture, being careful not to overmix the batter. Allow the batter to sit for 5 minutes. In the meantime, preheat your waffle iron. Spray with nonstick spray or brush with additional melted butter. 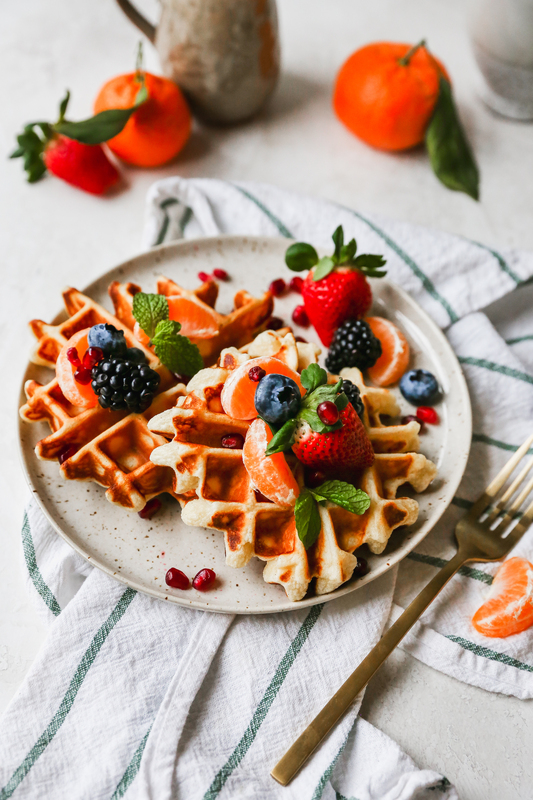 Pour ½ cup of the batter onto the waffle iron, close, and cook until the waffle is golden and crisp, about 2-3 minutes (this will depend on your specific waffle iron). 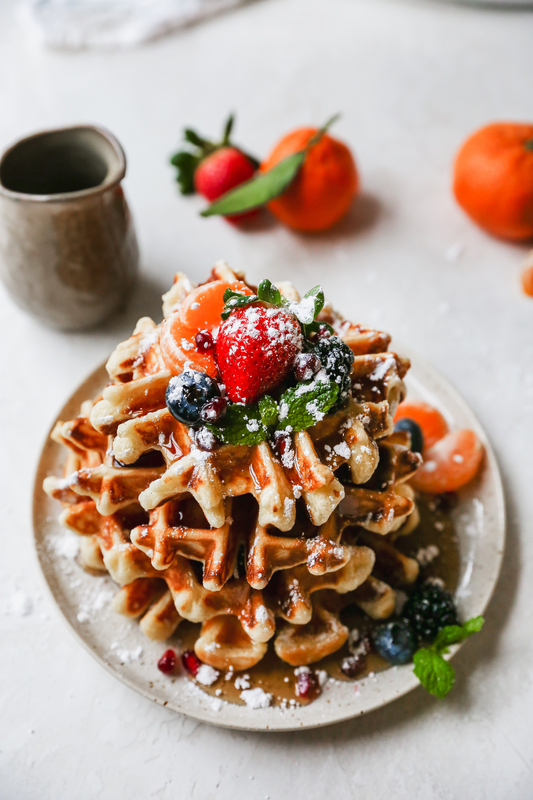 Remove the waffle, place on a rack set over a baking pan, and place the pan in a 200°F oven to keep warm. Repeat with the remaining batter or until all the waffles have been made. 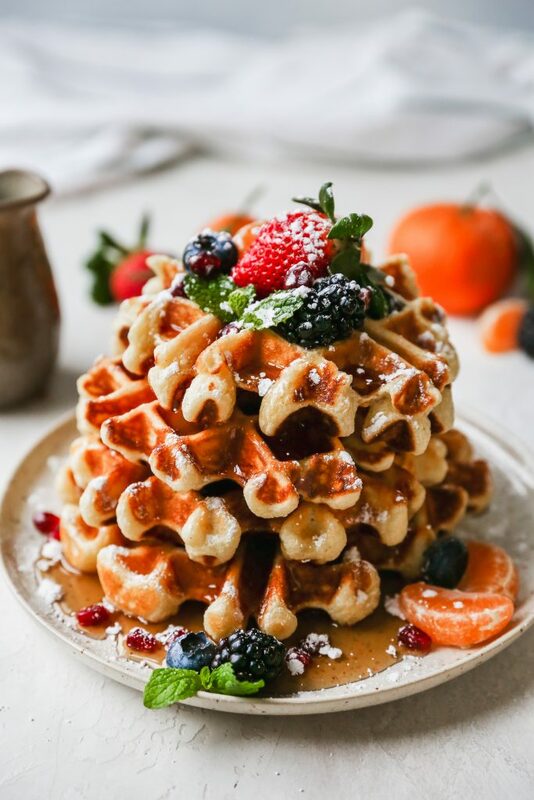 Serve the waffles warm and topped however you desire. I went with a mix of berries, citrus segments, syrup, fresh mint sprigs, and powdered sugar. I like to make a large batch of waffles and freeze half of them. Once they have cooked and cooled completely, I wrap each waffle in plastic wrap and store in Ziploc bags in the freezer. 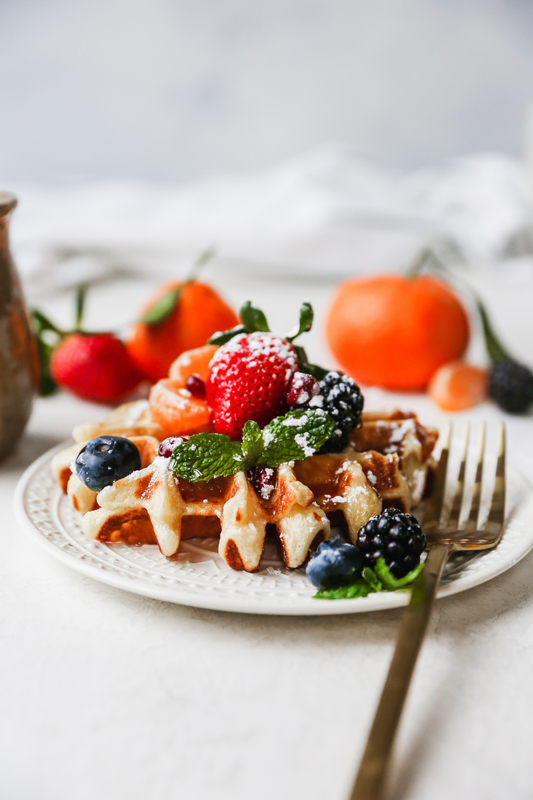 I reheat the frozen waffles in a 375°F oven for 10-15 minutes, or until they are warmed through and have crisped up a bit.